Elizarov’s book, ‘Toons, is the only one I’ve read (previous post) thus far. The writer known as Figl’-Migl’ is new to me: this pseudonym means “trick” (though the Russian term is plural) so I guess I’ll think of this writer as The Trickster. Bykov has already won the NatsBest award once. The winner will be announced on June 5. The jury for the next level is chaired by Kseniia Sobchak…. Comments about any books you’ve read, want to read, or have no intention of reading would be most welcome! There’s a bit more here on OpenSpace.ru. I always enjoy book award long lists so was happy to find the 2011 Big Book long list today -- it was announced during a press conference at a Moscow pel’meni spot that Joseph Brodsky liked to frequent. The Big Book short list will be announced on May 25. Big Book’s announcement notes that the list contains 40 books by 39 authors, many of whom are new to the Big Book universe. Mikhail Butov, who announced the list as the expert group’s chair, mentioned the presence of many young writers and praised the nominated works for (I’m paraphrasing) their liveliness and relevance to contemporary life. It’s hard to believe that Vladimir Sorokin, nominated for Метель/The Blizzard (previous post), has never even made a Big Book long list… though of course The Blizzard probably has no chance of winning the big Big Book prize because it already won the NOSE award. (Don’t even get me started on this “no repeaters” thing.) The only writer to appear on the Big Book long list for two books, Iurii Buida with Жунгли/The Jungle and Синяя кровь/Blue Blood, is also new to Big Book. Oleg Zaionchkovskii for Загул/The Drinking Binge or maybe The Bender. Natal’ia Kliuchareva for Деревня дураков/The Village of Fools – I enjoyed Kliuchareva’s story in the Rasskazy collection very much (previous post). Viktor Pelevin for Ананасная вода для прекрасной дамы/Pineapple Water for the Beautiful Lady, a collection of stories that’s Number 3 on the bestseller list today. Andrei Rubanov for Психодел/Psychodeal, also on the National Bestseller long list. Manuscript No. 163, Овсянки/Yellowhammers – this has to be Denis Osokin’s book… it was presented at the London Book Fair. The book has already been adapted into a film, known in English as Silent Souls. Based on a film review I read, it sounds excellent. Andrei Astvatsaturov’s Скунскамера/Skunkskamera, also on the National Bestseller longlist. Liudmila Ulitskaya’s Зелёный шатёр/The Green Tent, which is Number 5 on today’s bestseller list. There are two authors on the list that I’ve been meaning to read for ages – Daniil Granin (Всё было не совсем так/That’s Not Quite How It All Was) and Marina Palei (Хор/The Chorus) – plus lots of names that are either new for me or only vaguely familiar. Which is exactly why I think long lists are so much fun. The highlight of my London Book Fair was meeting so many of you – it was tremendous fun talking about books and learning about what you do. A colossal thanks for telling me so much about yourselves and your work. I enjoyed the collegial atmosphere very much. I may get myself into a quagmire here but I’ll follow up on Russian Dinosaur’s apt comment about Mikhail Elizarov “blatantly over-performing.” The absurdly awkward combination of Elizarov, Zakhar Prilepin, and Polina Dashkova, moderated by Bridget Kendall, for “Beyond the Headlines: Writing about Russia Today,” resulted in a messily fascinating session. Yes, the three writers incorporate political themes into their books but there was palpable tension between Dashkova – who claimed she doesn’t write detective novels (!) – and Prilepin and Elizarov. By the end, Elizarov had trotted out statistics (whose, I don’t know) comparing deaths during the Stalin era, Queen Victoria’s reign, and the Great Depression, inspiring audience gasps (I don’t think I was imagining that) and much discomfort on the dais. Which was probably exactly the reaction he sought. Like Russian Dinosaur and others I spoke with who were there, I saw it as an exaggerated performance intended to provoke. Whether or not you like Elizarov’s tactics and/or writing, he’s a controversial and imaginative writer who explores uncomfortable territory about life, society, and politics. My post about his Librarian, and subsequent comments, demonstrate some of the discomfort he raises. He likes to poke the bear. I, too, have to wonder if he was bored… he and Prilepin were both extremely theatrical, which certainly kept things lively. The evening program, with events held around London, contrasted nicely with the official-feeling daytime panel discussions held on daises with headphones for simultaneous interpretation. I attended several programs at Pushkin House, where a small, homey space encouraged mingling and discussion between writers and the public. “A Short History of Russian Literary Non-Conformism,” a packed evening hosted by the tireless Irina Prokhorova, included readings and music; I was very sorry to miss percussionist Vladimir Tarasov’s late-evening performance, but enjoyed readings from writers, particularly Zinovy Zinik, who described his “double zed” cocktail of vodka and lime. I wish they’d been served! Two evenings later, in a Q&A session with fans, Liudmila Ulitskaya revealed various aspects of her personal life and tastes: she eats oatmeal, rarely take vacations, and when asked about writers she respects, listed Andrei Platonov, Liudmilla Petrushevskaia, and Venedikt Erofeev’s Москва-Петушки, among others. Some London-based friends and I also had a great time at Foyle’s hearing two writers we don’t even read much: Dmitry Glukhovsky and Sergey Lukyanenko. They were engaging as they spoke about their fantasy/science fiction books, showing plentiful good humor. Plus respect for Johnny Depp. The audience clearly loved them: the line for book signing was very long. There’s lots, lots more I could write, including about two Mikhails I particularly enjoyed hearing speak in panels and talking with, albeit briefly: Mikhail Shiskin called for more universal themes to move Russian fiction out of a “ghetto” and back into world literature, and Mikhail Gigolashvili discussed how multilingual life makes him more creative… I was very happy to hear Gigolashvili has another book on the way. Then there was my most unexpected moment: debating the ending of Asystole with its author, Oleg Pavlov. Finally, I should note that I’ve already heard about several good, varied possibilities for English translations, meaning LBF’s Russian program is already accomplishing what it was supposed to accomplish: sales. I’m awaiting news that I can make public. The full LBF Russia program is online here; if you have a question about a specific event or writer who is not named Dmitrii Bykov (Is it true he bailed out and went to California!? I guess so. ), e-mail me or add a comment. Maybe I or someone else can offer information or clarification. I had an absolutely wonderful time but am happy to be back at home, recovering my mental energy and getting back to my reading and writing! Again, thank you to everyone – particularly Academia Rossica, British Council, and all the attendees I met and heard – who made the book fair so productive, worthwhile, and fun for me. I can’t wait to do it again in New York next year. Russian Dinosaur: A fun summary of events with a Valerii Briusov tie-in. And Elif Batuman’s boots. Russian BookWorld: This radio show includes discussion of the Новый литературный обозреватель/New Literary Observer program and the ever-energetic Elena Rubinova’s quick interviews with Irina Prokhorova, Zinovy Zinik, Mikhail Shishkin, and Andrew Bromfield. Publishers Weekly: A pre-LBF piece about the Russian book market. And full LBF coverage. OpenSpace.ru: Some nice photos of the book fair itself and, apparently, a reception. Up Next. I can’t wait to get back to writing about the books I read! Coming up: VladimirSorokin’s Путь Бро (Bro), Aleksandr Snegirev’s Тщеславие (Vanity), then a book by Vardvan Varzhapetian, Margarita Khemlin’s husband, who is also a tremendously engaging writer. I have a horrible case of чемоданное настроение – “suitcase mood,” being antsy to travel – but want to write about Margarita Khemlin’s novel Крайний before I forget everything I want to say about the book… I apologize for this slapdash post, particularly since I don’t mean to give Krainii short shrift: it’s a good book. Though it’s not my favorite piece of Khemlin’s work that’s largely because I loved her Klotsvog (previous post) so very much. Krainii is a grittily powerful first-person narrative, a life story told by a Jewish man, Nisl Moiseevich Zaidenband, who grew up in Oster, in central Ukraine, and was a partisan as a teenager during World War 2. Nisl is a loner, and the book is a confession of sorts. He tells us on the first page that he has no “collective” to hear his story, meaning we, his readers, all of humanity who will listen, become his people. The word in the book’s title, Krainii, has multiple meanings that relate to Nisl: the Oxford Russian-English dictionary’s suggestions include words like extreme, last, uttermost, and, for sports, outside. The root word край (krai) is often used for edges and brinks; it’s also used for regions. Krainii can refer to the last person in line, and one of you who read the book suggested “fall guy,” also very fitting for this context. Khemlin inserts lots of treacherous edges and brinks into Krainii. Oster is near the USSR’s western border and people speak a mix of languages; that occasionally put me on the linguistic brink. Nisl’s life history reads like a series of close scrapes with wartime death, the law, and the difficulties of being Jewish. His teenagedom includes hearing Nazi troops kill the Jewish population of Oster, and his escape involves help from an unexpected source and using an assumed name that hides his identity. He learns the useful craft of haircutting from older partisans. After the war Nisl commits a crime, making himself a wanted man; a partisan friend helps, hiding him the woods, essentially making him a partisan again, living away from society. Nisl survives again. Khemlin works plenty more into Krainii: Nisl is reunited with his parents after the war, tries to establish relationships with women, and lives with an elderly Jewish couple. The Holocaust subject of soap made from human fat comes up when Nisl takes possession of bars of soap, leading to some emotional scenes. Some of the book’s most striking passages – particularly about the elderly couple and their house, and an eerie double death – made me realize, yet again, that I’m probably missing allusions to Jewish storytelling, traditions, and mysticism. Or maybe not? I don’t know. 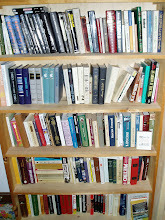 I have a few books on my shelves to broaden my knowledge – Sholom Aleichem stories and I.B. Singer novels among them – and am planning to mine the Yiddish literature posts on Wuthering Expectations, too. I’m open to suggestions, particularly if you have a favorite novel to recommend! Level for Non-Native readers of Russian: 4/5. Some passages are very easy to read, others are difficult because of mixed language. Up Next: I hope to queue up a quick post about Vladimir Sorokin’s Путь Бро (Bro), which I found silly but painfully absorbing, before I leave. After that, I’m not sure: I’ll try to post from London about the book fair but may not have much time. My next book post will likely be about Aleksandr Snegirev’s Тщеславие (Vanity): I’m enjoying Vanity’s very humorous account of finalists for a young writers’ book award. They’re at a rest house outside Moscow for literary seminars, which brings back lots of memories of workshops at rest houses with lousy food and after-hours parties… it’s just the thing for my suitcase mood. Disclosure: I’ve translated one of Margarita Khemlin’s stories.